Obtaining and integrating location data into the day-to-day business operation policies and practices are the vital tasks in business and marketing. A good amount of data with geospatial details helps businesses to develop clarity for carrying out business plans effectively. Because internet-based marketing has opened the entirely new avenues of marketing opportunities to the businesses and limitless searching/purchasing opportunities to the customers, it has become all the more important for businesses to identify who their current as well as potential customers are and where they live. Moreover, location data is equally important for knowing about the competitors in the market. New businesses cannot venture into the market without carefully studying how their competitors are distributed across a location. The same fact applies in the case of business expantion of the well established businesses too. In the age of customer engagement—via social media, email newsletters, RSS feeds and loyalty schemes etc.—leaving the customers unengaged means losing them to the competitors. 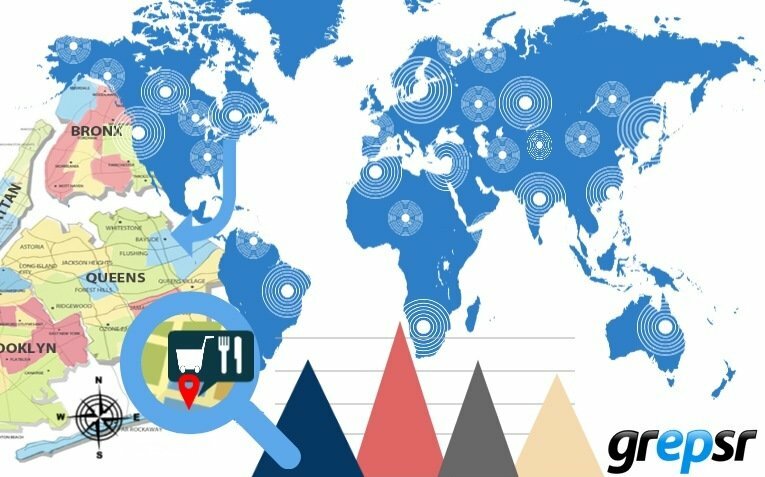 It is not just the location data and information of the customers that is important for businesses for sending out engaging samples, gifts, products, or offers at customers’ doorsteps. Instead, addresses of the business partners and associates (suppliers, distribution facilities, retail stores etc., for example) and, most importantly, that of the competitors are equally important for leveraging overall functionality and competitive advantages. In early 2013, one of our clients, a US-based producer of electronic devices, sent Grepsr a job request. The request was related to aggregating complete address information of about one million businesses. Presumably, a sizable number of these businesses were competitors. Additionally, we were also instructed to identify and tag the social media presence of the businesses. Merging of both the digital and physical addresses was a way of keeping location-based database in its entirety which could be used for multiple purposes. Customer review and social media websites, for example, were important for determining the popularity and customer engagement levels of the specific companies in the specific location. Because location data has a broad implication for businesses and because inaccurate address information can have various harmful consequences, Grepsr aims to provide our service products in the easy-to-use standard formats and with nonnegotiable quality, consistency, and realiability. We work with a clear notion that the address datasets we provide to our clients are vital for their business operation, extension, and coverage. In this particular case too, we laid our attention on getting the most authentic data applying deep web crawling and comprehensive data extraction techniques. Once we had all the data we needed, we set out to cleanse and standardize the data by applying deduplication and verification processes. Then we integrated the physical addresses of the businesses with the information about their corresponding social media platforms and their ratings. We were able to complete the whole job and deliver the results in the standard format in a week, much earlier than the timeframe provided to us by our client. I am positively impressed by the speed and accuracy of your service. You have done a commendable job. I am sure we will have more projects to work together on in the days to come.